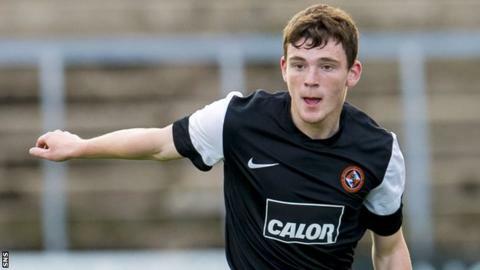 Dundee United have accepted an improved bid from Hull City for Scotland left-back Andrew Robertson. The 20-year-old will now be able to discuss personal terms with the English Premier League side, who are offering more than £2m plus add-ons. A Tannadice source told BBC Scotland earlier this week that three approaches from West Ham had been rejected. And other clubs have expressed an interest in the defender signed from Queen's Park last summer. Within nine months of making the step up from the Scottish League Two amateurs to the Premiership, Robertson made his Scotland debut in the March friendly against Poland. He made 46 appearances in his first season with United, scoring five goals, as they finished fourth in the table. Robertson's performances led to him being voted PFA Scotland Young Player of the Year. United have already this summer sold midfielder Ryan Gauld, with the 18-year-old joining Sporting Lisbon for a fee of around £3m.